Home / Entertainment News / Nice videos of Citizen TV’s YVONNE OKWARA burning fat in the gym, We endelea tu kulea kitambi. 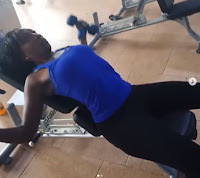 Nice videos of Citizen TV’s YVONNE OKWARA burning fat in the gym, We endelea tu kulea kitambi. Thursday, August 30, 2018 - Discplined and seasoned anchor, Yvonne Okwara, has been keeping fit and sharing videos of her work-out. The eloquent anchor who holds a senior position at Citizen TV after she was poached from KTN posted these videos keeping fit on her Instagram page, something that should challenge all women out there.